Heneage Street Winding Hole is a minor waterways place minor waterways place place on the waterways major waterways place village town city on the Birmingham Canal Navigations (Birmingham and Fazeley Canal - Digbeth Branch) between Aston Junction (Junction of B&F and Digbeth Branch Canals) (1¾ furlongs to the northwest) and Proof House Junction (4¼ furlongs and 6 locks to the south). 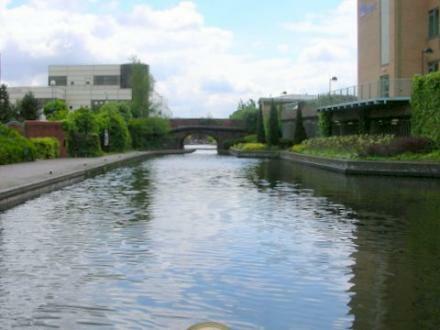 The nearest place in the direction of Aston Junction is Site of Dartmouth Street Basin (Infilled); ¼ furlongs away. The nearest place in the direction of Proof House Junction is Heneage Street Bridge (With Pipe Bridge alongside); ¼ furlongs away. 112 Corporation Street, Birmingham — 1010 yards to the southwest. 14 - 20 High Street, Digbeth, Birmingham, B12 0LN — 1598 yards to the south. 8 Bennetts Hill, Birmingham, B2 5RS — 1435 yards to the southwest. The Bullring Shopping Centre, Birmingham, B5 4BE — 1385 yards to the southwest. 139 New Street, Birmingham, B2 4NU — 1366 yards to the southwest. 78 Digbeth High Street, Birmingham, B5 6DY — 1462 yards to the south. Aston Triangle, Birmingham, B4 7ET — 341 yards to the southwest. Upper Mall East, Bullring, Birmingham, B5 6 — 1311 yards to the southwest. GIBB STREET DIGBETH, Birmingham, B9 4AA — 1511 yards to the south. 3-5 St Pauls Square, Birmingham, B3 1QU — 1470 yards to the west. Victoria Square, Birmingham, B3 3 — 1580 yards to the southwest. Birmingham, B2 5 — 1564 yards to the southwest. Bullring Shopping Centre, Spiceal Street., Birmingham, B5 4BE — 1370 yards to the southwest. Birmingham — 1299 yards to the southwest. 1623 yards to the southwest. Bordesley — 1383 yards to the southeast. Moor Street, Birmingham, B4 7UL — 1192 yards to the southwest. 1 Victoria Square, Birmingham, B4 6QS — 1623 yards to the southwest. New St, Birmingham, B2 4 — 1552 yards to the southwest. 14-16 Temple Street, Birmingham, B2 5BG — 1417 yards to the southwest. 39-40 Temple St, Birmingham — 1425 yards to the southwest. The Alchemist Birmingham, The Grand, Colmore Row, Birmingham, B3 2DA — 1225 yards to the southwest. 20 Bennett’s Hill, Birmingham, B2 5QJ — 1458 yards to the southwest. 18 Barwick Street, Birmingham, B3 2NT — 1220 yards to the southwest. Birmingham, B5 4AH — 1555 yards to the southwest. 7 Spiceal St Unit 1, Birmingham, B5 4 — 1411 yards to the southwest. Steelhouse Ln., Birmingham — 719 yards to the southwest. Birmingham Museum and Art Gallery, Birmingham, B33 — 1624 yards to the southwest. 67-71 Temple Row, Birmingham, B2 5LS — 1300 yards to the southwest. Steelhouse Lane, Birmingham, B4 6NH — 689 yards to the southwest. Birmingham, B5 5 — 1426 yards to the south. Birmingham, B7 4 — 801 yards to the southwest. 7 Bennetts Hill, Birmingham, B2 5ST — 1428 yards to the southwest. Church Street, Birmingham, B32 — 1269 yards to the southwest. Custard Factory, Birmingham, B9 4AA — 1450 yards to the south. Millennium Point, Curzon Street, Birmingham, B4 7XG — 610 yards to the south. Mill Lane, Birmingham, B5 6 — 1532 yards to the south. Lower Trinity Street, Birmingham, B9 4AG — 1545 yards to the south. Bullring, Birmingham, B5 4BU — 1363 yards to the southwest.